Are you a ping pong fan? Then this game is for you! Are you able to play it? So, just use the mouse to control a racket and set the best record. Just imagine that you are a pirate and you want to play it too! Be sure that you can do that! Vanquish the game. Well, we wanna to see how good you are. So, show us if you are Pong skills good enough for the yearly Pirate? Well, how about shark motivated exercise. 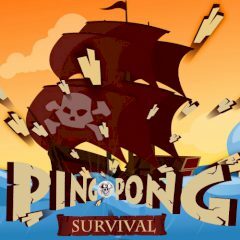 In this game you will see an another way Pirates train for the yearly table tennis tournament is by making someone walk the plank and balance a ping pong ball. Just try to unlock achievements and rewards brave trainee. Thus, you will be able to become the only one winner of the game. Do you think that it is so easy? Well, then just do it right now and you will be the real winner!